This is an offspring of Le Petit Salut in Dempsey. As the word Bistro suggests, this should be a easier-on-the-wallet version of the bigger sister, but with the same quality in French cuisine for a lazy Sunday afternoon. With 6 entrees and 6 mains and 6 desserts choices, you have 216 combination of set lunches to choose from. Not bad for $28+++ pax. We had 5 adults for lunch and so had to make a painful choice of eliminating one from each list. Out went the octopus salad (old folks have no teeth for that), Catch of the Day was next to go (we are very picky about seafood), and pineapple was dropped from the dessert list. So we had a taste of all the rest on the set lunch choices, and added 1/2 doz of freshly shucked oysters and pan-seared foie gras for good measures. The Duck foie gras was of the same standard as the bigger sister, well seared while locking in the juices. 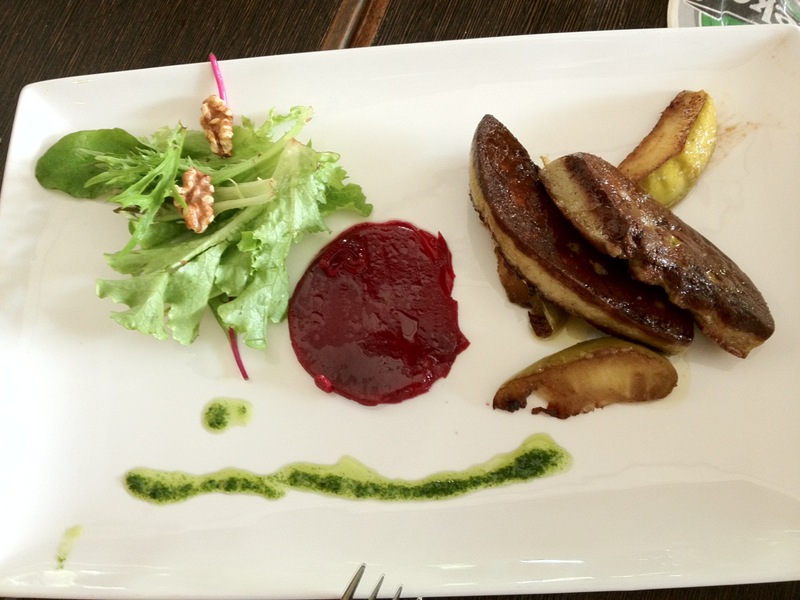 While the skin was crispy, the inner duck liver was not overdone. Oysters were fresh, nothing less was expected of course. Then came 2 salads. We could not distinguish the difference between the 2 as the base was the same rockets and romaine (mesclun salad), the only difference laid in the half-poached egg and the sliced tomatoes instead of cherry tomatoes. The escargot was alright, and the only disappointment was the sausage and rillette that turned out to be just another pate. The consomme, well, I had none of it bacause my daughter wouldn’t let me. So it must be good. 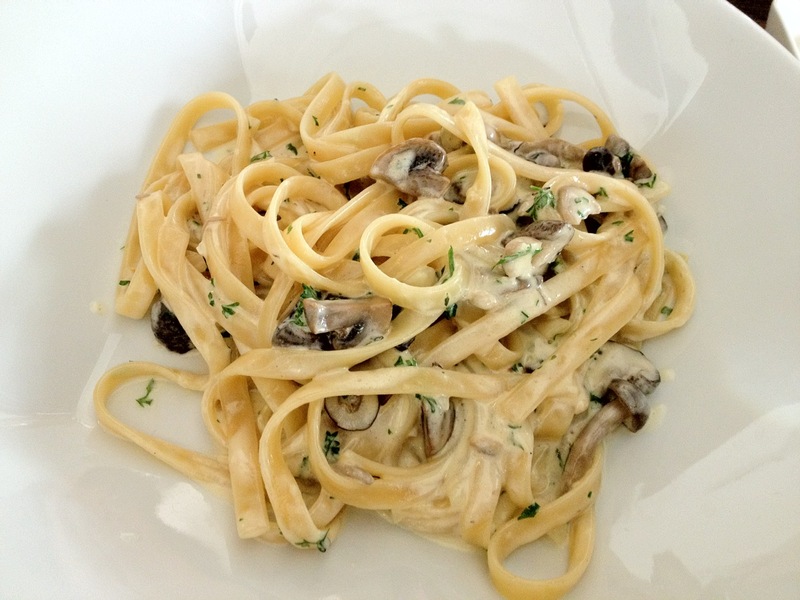 Again, my princess held on to the pasta as it was so tasty that I managed only the last morsel of mushroom. The braised pork shoulder and onglet beef were so-so, but the confit of chicken was done properly with a crispy skin and tender insides – a good departure from the duck confit that we were used to but less oily. 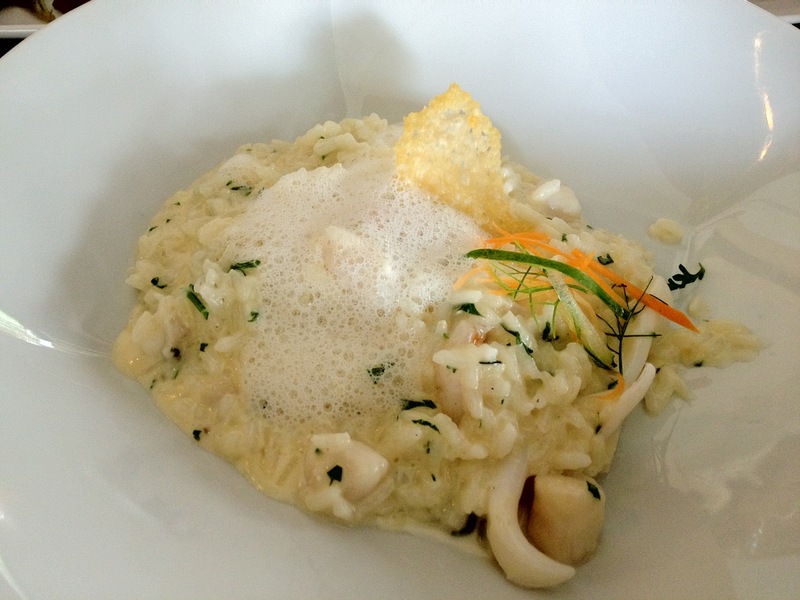 The risotto was also flavourful and well salted but not too overpowering with the cream sauce, wonderful for a hot afternoon dining alfresco. The pasta and risotto dishes stood out so much that we started to wonder if this is a French bistro or an Italian cafeteria. The the desserts were served and we knew straight aware their lineage and pedigree. The pastries were all good. 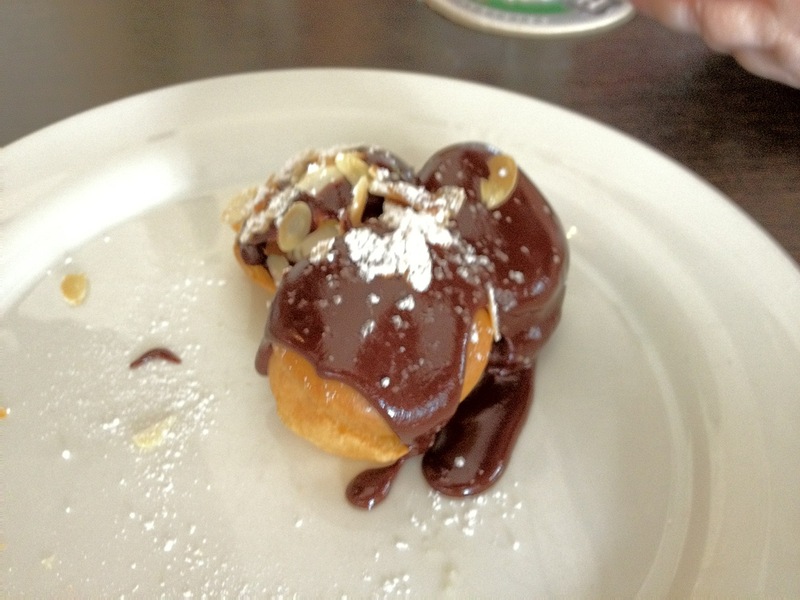 The Choux buns stood out with a warm chocolate sauce and cold vanilla ice cream as filling to the puff. The interchange of warm and coldness in the mouth was very satisfying. Nothing to fault with the creme brulee (not too sweet which we liked), the cheesecake and mouse cake. The fruit crumble was made like a cupcake and was a mess to behold but tasted alright with the right mix of tangy, sweet and crunch all in the concoction. Ended a good afternoon family lunch with coffee that came with the lunch set. Service – didn’t notice the service staff. Food – good to excellent, value for money. Ambiance – alfresco, lazy neighbourhood, nice. Location – parking was ample on a Sunday afternoon.